“kusf was taken off the air this morning at 10am our transmitter was sold by usf behind our backs. we will continue streaming online in a day or so. and we are having a major protest/meeting at usf tomorrow night (wednesday) at 7pm on the campus of usf at phelan hall. please pass the word and get all you know in the bay area to represent! we need to show community support & outrage. 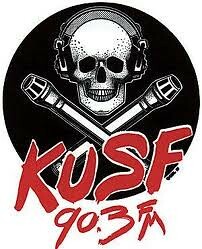 KUSF has long been considered one of the premier college radio stations in the country, and helped launch the countless artists since it instituted an alternative music format in the late 70s/early 80s. Countless artists were launched and supported in San Francisco if not nationally through its djs, which included future music executives Peter Standish, Tim Hyde, Thomas Westfall, Harry Levy, Tim Ziegler, David Katznelson, Linda Ryan and many more. 415 Records president Howie Klein was a pivotal character too (he worked at WUSB-AM previously!) and wrote an appropriately intense remembrance here of KUSF. In addition to the recent sales of WRVU Nashville by Vanderbilt and KTRU Houston by Rice, WDUQ, a classical and news outlet based at Duquesne University in Pittsburgh for decades, was just acquired by the community station WYEP. I hope my alma mater SUNY Stony Brook doesn’t divest from WUSB, but this seems to be an epidemic when one of the most influential and recognized stations is sold and taken off the air at a moment’s notice. While the school’s costs vs. measurable success (revenue/prestige/popularity with students) numbers may not have added up, to make the change without informing the volunteers working at the station is disrespectful to the history and prestige the station has brought to USF and the world, not to mention the current students who are only there to express themselves and learn. College radio gives people a chance. I hope the students of USF and the listeners of KUSF will continue to grow without 90.3 FM. One thing’s for sure, the uproar of this event will create a surge of interest online that will hopefully bring many listeners to KUSF.org. In another painful insult added to injury, USF has stymied that transition by hijacking the website until technical upgrades can be made. All the discussion about the demise of the institution cannot be channeled into a new listener experience. Shameful. Selling KUSF without prior and fair notice to the staff and students is outrageous in my opinion! The manner in which the staff was treated by the V.P. of the school as well as other officials was reprehensible! I applaude the strong stand taken by the station staff and the leadership shown, among others, by my son, Irwin Swirnoff.